Any adjectives you know, even “awe-inspiring” and “otherworldly”, simply won’t do the Skaftafell landscape justice, so a thesaurus will help no end when texting your mates back at comparatively dreary home. Arriving at Falljökull glacier you’ll not only be lost for words but may well fall over at the sight of the wall you’re about to ascend, hence the poles to steady yourself while you take it all in. Likewise, muscle rub will ease your jaw after it’s been hanging open for most of the day and in case it all felt like an epic Norse dream, you’ll have HD evidence to prove you did in fact just scale some of Iceland’s finest wilderness! Our mantra is “Unique and Unforgettable Experiences”, which led us to Iceland’s most respected guides, a super dedicated and experienced crew who have achieved more accolades of excellence than any other company. This lot love glaciers so much they’ve based themselves at the stunning Vatnajökull glacier, so from the get-go, you’ll be in the company of people who live and breath Icelandic adventures. 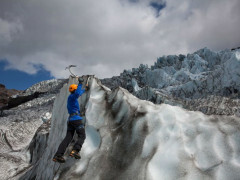 They pride themselves on taking out small groups to ensure a highly personalised service that puts you at ease if you’re a novice and pushes you over the edge, literally, if you’re an ice climbing aficionado. 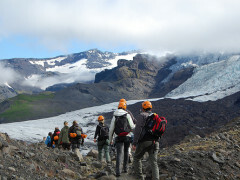 Climb some of Iceland’s most impressive glacial terrain. Maximum 5 people to a group. Suitable for novice through expert level.